Location: About 40m south of junction with Castle Street. Built circa 1928 as offices for Pearl Assurance. Exceptional 4 storey, 4 window classical facade in fine Portland stone ashlar to reinforced concrete structure. Checked back angles; plain parapet with simple 3rd floor openings over main dentil cornice. Stepped impost bands to giant arch treatment of principal floors; Ionic half-columns, stepped reveals. Marginal glazing and bronze infill panels, plate glass. Cornice over polished granite ground floor surround, modern shop front to left; original recessed office entrance to right with small-pane double wooden doors and panelled surrounds. Not accessible at resurvey but said to have good openwell staircase with bronze(?) balusters incorporating iron motif to handrail. 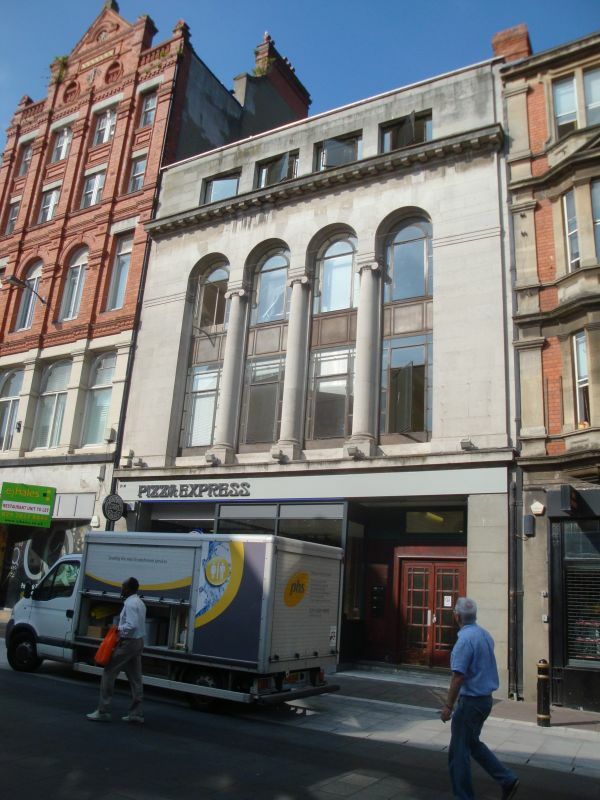 Included as a scarce example of fine 1920s commercial architecture in a key Cardiff location.